Well hello to you my reader chums! 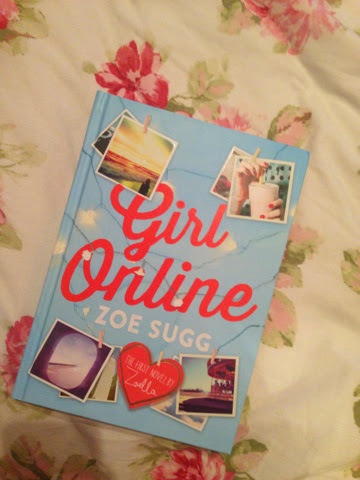 Today I'm going to do a review of Zoella's book: Girl Online. I've been a big follower of Zoe for a while now and when I heard she was bringing a book out a couple of months back I was super excited! Before I go into it I want to say I still fully support Zoe, as I know surrounding the book she's been getting a lot of hate for getting help. This is something Zoe did state in several of her vlogs beforehand and I do think it's a bit ridiculous how the media have viewed the situation, twisting things to get loads of views. That's just my opinion on that situation, now lets get into the review yay! 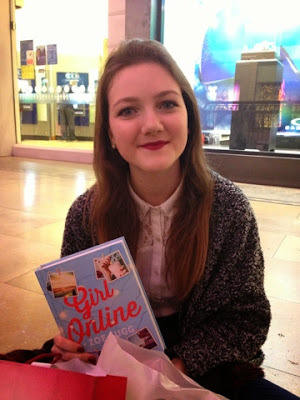 When I first began reading Girl Online, I was hooked into the characters and story straight away. The way in which it was written made the tale very truthful and relatable, Penny ( the main character) was very similar to me with the thoughts and actions she has/does. I love the element of anxiety in the novel, I think it's nice to see a story bring the struggles of it to life as it helps raise more awareness to the issue. A lot of people especially teens suffer from anxiety and its not spoke about as much as it should. Also by there being advice and tips on how to get though a panic attack, it gives those who read the novel a chance to see if these ideas help. I grew a little attachment to some of the characters, especially Elliot or Wiki as he is known as on 'Girl online's' blog. He just seemed like the perfect boy best friend that every girl wants! I think its the sweetest thing that Penny and Elliot have known each other for so long and have a little knocking system to chat to one another between their bedrooms. It's such a strong bond and it was lovely to read about. Penny's family were another joy to read, I love the fact they had their own business and were all very close to one another. They have this very loving and accepting approach to everything which goes on throughout the book, especially always having Elliot round as if he's part of the family. The main theme is the blogging side of the book, hence the name 'Girl Online'. Penny uses her blog as a way to express her feelings and write things that are on her mind. Its a way of escaping for her which is why she writes it as 'Girl Online'. I can really relate to this idea because my blog is a way for me to just say whats on my mind or express my love for certain products or books. It makes me very happy, similar to Penny in the book. I love the bits where the story is broken up into the actual narrative and Penny's blog posts because it makes it different from other teen books I've read. By adding a blog into the mix of the story and other things such as social media, it brings the story very much up to date, which again makes it even more relatable to young readers. Another issue in the novel is cyber bullying, I don't want to talk about what happens because I don't want to ruin it for anyone, however I will say, its good that they touched on an issue which is much more common and not talked about enough similar to anxiety. I feel in this novel, Zoe talks about the issues relevant to teens today, something which I was very fond of. The setting of the novel was Brighton. I loved how it was set here because it gave a little taste of special parts of Brighton, the atmosphere of the beach, pier and livelihood. I've always wanted to see Brighton to see the pier, the lanes and go to Choccywoccydodah, all of which are described in the novel, presenting a snippet of what its like there. New York, New York! The other setting the book is one of the most amazing cities, New York city! Penny is lucky enough to visit on a spectacular adventure which has a big element of romance intertwined on her trip, which I'm sure you'll find out more about if you haven't yet read it. I love the way New York is described because it brings the magic of the place alive and really helps you capture the moment. The language in the book was very basic, there were times when things were described in much detail and times when they weren't, for example even though you learn of Penny's hair colour, you never really find out what she looks like. Saying this by the simplicity of how it was written, it captures that it is in a teenagers perspective and makes it more relatable and truthful. I think if the language was more complex it wouldn't have felt like it was from Penny's perspective at all. Also, I did like the breakdown of the text messages that Penny sent to her friends as it broke up the layout a bit and showed it was a modern story. A happy ending? I'm not going to ruin it for any of you, however I would say yes its a happy ending and after what occurs in the middle of the story as much as you want it to end happily you don't think it will. Yet, there's a surprise at the end and I had a little weep of joy, but you're all going to have to read it and find out for yourself! Overall, it was such a joyful read and I loved every bit of it! The book was a page turner, I loved how the story flowed and all of the characters relationships. If you're into a very relatable teen type novel, you will sure like this! Have any of you read the book? Let me know what you think! 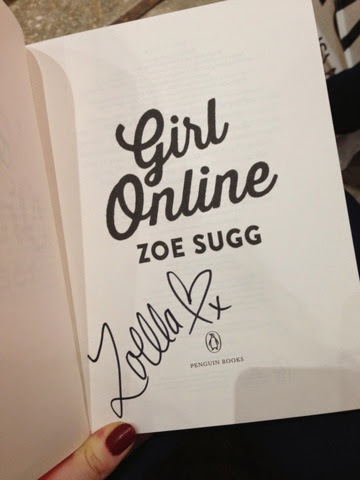 A day after the novel was released, I was lucky enough to get tickets to Zoe's book signing. It was such a surreal experience seeing her in person but she was honestly one of the loveliest people I've ever met! I'm so happy I finally got to say hello after the good while I've been watching her videos for, even if it was just for a few moments. Here's me lining up for the signing. This is the only picture I managed to get because beyond a certain point you were unable to get pictures and when I went in the room my hand was shaking too much to take one! However I'm over the moon I finally got to meet Zoe, one of the people I look up to! I hope you enjoyed this review and this post! I'm not sure if I am going to get the novel. I am nineteen. A lot of people have said that the language is simple which gives me this idea that the book is for people in their earlier teens. I think Zoella thinks that a lot of her viewers are 14 or 15. But she has just as many older viewers too and I dont really know if the book is suitable for them. I get where you're coming from as I am 18 myself and I do think it is aimed at more of the younger viewers. As it is quite simple I did read it rather quickly and would have preferred something more in depth, nevertheless I did enjoy it but I don't think it's something everyone would get into.